Releasing the genius of an individual, an enterprise and a society is a central pre-occupation of the contemporary business environment. 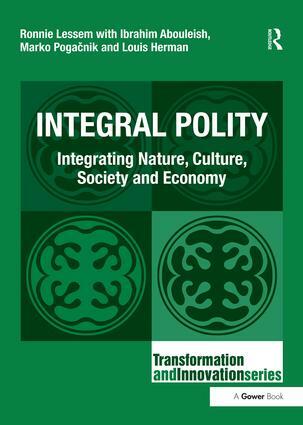 A fascinating approach to how we can begin to tackle this challenge is presented by the authors of Integral Polity. Integral spirituality, integral philosophy and the integral age, at an overall or holistic level of consciousness, has therefore become a strong enough idea to form the genesis of a movement over the course of the last half century. Taking as a starting point the ground-breaking work of the Trans4m Centre for Integral Development this book applies such an ’integral’ notion to the realms of business, economics and enterprise. To be successful, an integral approach must recognise the nuances of its environment - an integral approach in India is different from that in Indonesia, or Iceland, and they may in fact complement rather than conflict. Therefore this book also provides a fascinating alignment of such ’integrality’ with, and between different ’southern’ and ’eastern’, ’northern’ and ’western’ worlds. Using case studies ranging across the globe this review of a newly integral theory and practice provides a new lease of life to what may increasingly be perceived as the self-seeking, insulated and occasionally violent and corrupt, realm of the political. Professor Ronnie Lessem is a Zimbabwean political economist, and graduate of Harvard Business School, who co-founded the Integral Worlds approach to Integral Development via the Trans4m Centre for Integral Development in Geneva. Professor Dr Ibrahim Abouleish is an Egyptian-born, Austrian-educated engineer and pharmacologist, ecologist and spiritual scientist, who received the Right Livelihood Award for founding Sekem, a Sustainable Community in the desert. Marko PogaÄ�nik, who studied at the Academy of Arts in Slovenia, is a conceptual artist and earth healer, and an iconic figure in his country, who designed the national flag of Slovenia and practises Sacred Geography around the world. Professor Louis Herman is a South African-born medical graduate of the University of Cambridge in England, now head of the department of political science at the University of Hawaii, West Oahu, renowned for his Primal Politics. This series on enterprise transformation and social innovation comprises a range of books informing practitioners, consultants, organization developers, development agents and academics how businesses and other organizations, as well as the discipline of economics itself, can and will have to be transformed. The series prepares the ground for viable twenty-first century enterprises and a sustainable macroeconomic system. A new kind of R & D, involving social, as well as technological innovation, needs to be supported by integrated and participative action research in the social sciences. Focusing on new, emerging kinds of public, social and sustainable entrepreneurship originating from all corners of the world and from different cultures, books in this series will help those operating at the interface between enterprise and society to mediate between the two and will help schools teaching management and economics to re-engage with their founding principles.